phpMyAdmin is the web-based administration tool for managing the MySQL, MariaDB and Drizzle servers; it helps in performing databases activities such as creating, deleting, querying, tables, columns, relations, indexes, users, permissions, etc. 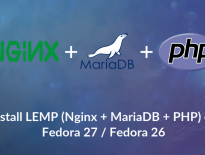 This guide will help you to install phpMyAdmin on Fedora 27 / Fedora 26/25. Install phpMyAdmin using the following command. By-default phpMyAdmin places the web config file in /etc/httpd/conf.d directory; it has the rules and access permission. phpMyAdmin can be accessed only from the localhost, to change that; we have to edit the phpMyadmin.conf file. In Fedora, web access is managed by the mod_authz_core.c module; so normal allow or deny rules won’t work even if you modify. Default config will look like below. Please comment out Require ip 127.0.0.1 and Require ip ::1 then add Require all granted just below to commented line. It will look like below. Log in as root (Database admin) or DB user. That’s All. Hope this helped you, we welcome your comments.